In the mood for a rich and decadent ice cream, but feel like you should be avoiding dairy, sugar, and really trying to eat better overall? Or, perhaps need a quick dessert for Easter? Well, here you are my friends. A delightful, quick, easy, sugar free, healthy treat that is surprisingly close to ice cream in taste and mouthfeel. 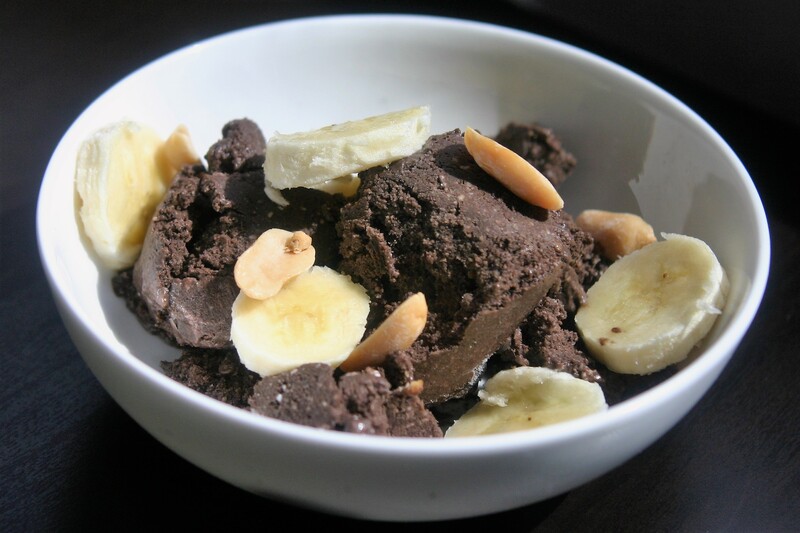 It is heavy on the banana flavor, but the chocolate and peanut butter do a lovely job of complementing it and bringing out flavors one would expect. This is nice cream is basically a smoothie and something I have considered eating for breakfast, maybe stirring it into my oatmeal. So many options for a treat made from real ingredients with no added sugar. Puree banana, coconut milk, vanilla, salt, and cocoa powder until smooth in a food processor or blender. Add peanut butter and pulse a few times to combine. Eat immediately, or store in the freezer for later. If storing in the freezer allow nice cream to thaw at room temperature a few minutes before serving. 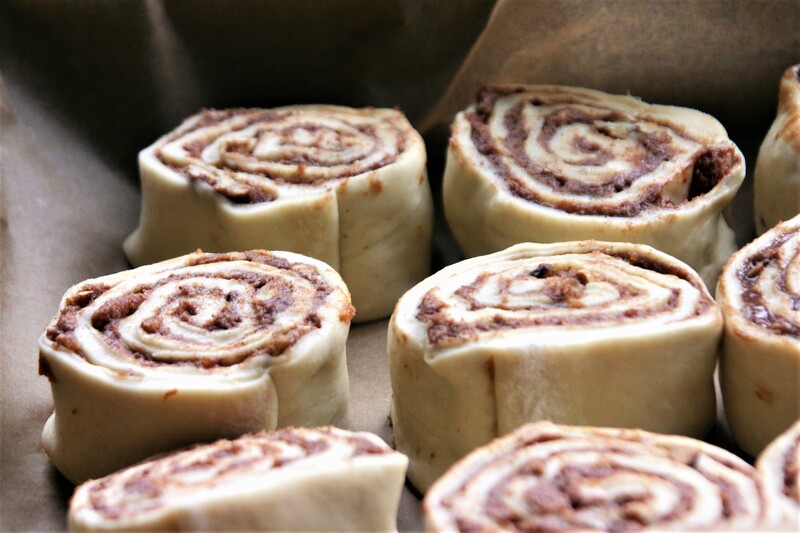 Who wants fresh, fragrant cinnamon rolls? Ohh, I do, pretty much every day! For several reasons I try to save them for special occasions, such as Easter. I have tweaked my recipe a bit to make it a little easier and give more consistent results. I also did some experimentation with various sugar free options, but haven’t perfect them yet. I’m happy to give suggestions if you leave a comment with a question, but I need to make a few more batches before I share the results. These are soft, pillowy, cinnamon filled, sweet nuggets of goodness. Perfect to make the day before and let rise in the refrigerator overnight and bake off in the morning just in time for breakfast. Because there are a few steps here that are a bit hard to explain I have made a video. In a small saucepan heat together the milk, Earth Balance, sugar and salt until the butter is almost melted. Remove from heat and stir until butter is melted. Make sure this mixture is warm, not hot or it will kill the yeast. Add 3 cups of the flour and yeast to the egg replacer/water mixture. Add the warm milk mixture and mix with the paddle attachment for 2 minutes. If you don’t have a stand mixer you can do this by hand. Switch to the dough hook and mix, adding flour 1/2 cup at a time until the dough forms a ball and no longer sticks to the sides of the bowl. Remove the dough hook and drizzle olive oil over the ball of dough, cover with a damp towel and set aside to rise for 1-2 hours. Once dough has doubled in size, punch it down then allow it to rest for 10 minutes. While dough is resting combine the filling ingredients and set aside. Place dough on a lightly floured surface and roll dough into a rectangle about 18″ by 12″. Spread the filling mixture evenly over the dough, all the way to the edges. Roll dough into a log and slice into buns, as large as you like. I like mine to be about 1 1/2″ thick. Place buns on a rimmed baking sheet or pan close enough to almost touch each other. Line the baking sheet with parchment paper (for easier cleanup). Let the the rolls rise until almost doubled in size, about and hour. Alternately at this point cover the rolls with cling wrap and store in the refrigerator overnight. They will slowly rise there. In the morning set the on the counter as your oven preheats and proceed as usual. Bake rolls for 20-30 minutes depending on their size, until golden brown. While the rolls are cooking combine the confectioners’ sugar, vanilla and milk stirring until smooth. When rolls are cooked remove from oven and drizzle with icing. One last brunch idea before Easter. If you’re like me, you pretty much always have the ingredients for this dish on hand, so even if you don’t feel like shopping you can still have an elegant brunch tomorrow. The Hollandaise sauce is one of my all-time favorite vegan things. It is just so perfect; creamy, rich, decadent, and healthy! Oh, so much more healthy than the “real” thing. I actually like it better too. You should serve this with something light and fresh to balance the rich sauce, such as some fruit or a mimosa or two. This is a quick dish, but you need to be hands on to get everything ready at the same time. Heat your largest skillet over medium-high heat until very hot. I use my use huge cast iron. While it is preheating whisk together the nutritional yeast, flour and salt in a small saucepan. Slowly drizzle the water into the nutritional yeast mixture whisking until smooth and set aside. Once your pan is hot (droplets of water sprinkled in the pan immediately sizzle and evaporate), add your oil and heat for a few seconds while swirling to coat the bottom of the pan. Place the tofu in the pan in a single layer (be careful as the oil will spatter when the wet tofu is added). Cook the tofu until golden brown on one side, 2-3 minutes, then flip and continue cooking on the second side until also golden brown, another 2 minutes or so. Once both sides are cooked remove the tofu from the heat, sprinkle the salt over the tofu, and drizzle the apple cider vinegar over everything. The heat from the pan will encourage evaporation. Set this aside in the hot pan to stay warm while you finish the hollandaise sauce. If you are a multi-tasker start this step right after you have flipped your tofu. If not, just do it after the tofu is done as it will be fine, but the sauce needs some attention. Put your nutritional yeast mixture on the stove and heat over medium-low heat whisking frequently until it has thickened to your desired consistency, about 3 minutes. When it is as thick as you would like, remove from heat and stir in the mustard and lemon juice. 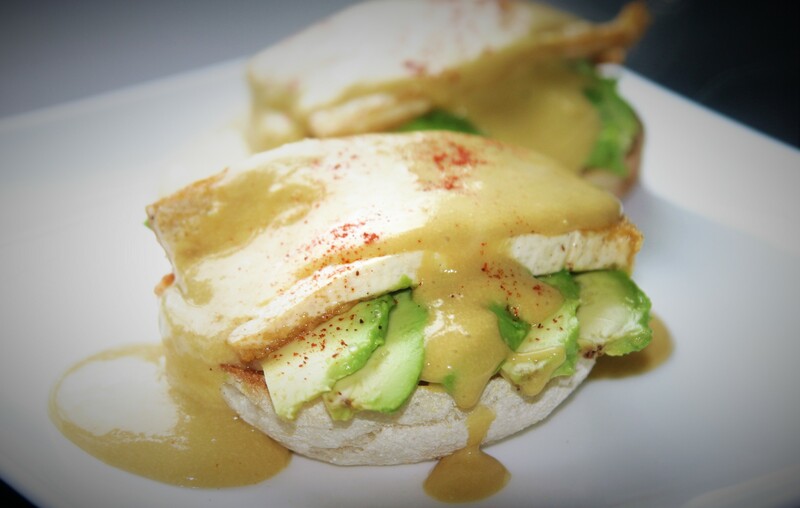 Place your toasted English muffins on your plates, top with slices of avocado, then the tofu, and drizzle the hollandaise over everything. Sprinkle a dash of paprika over the top for color if you like and serve immediately.